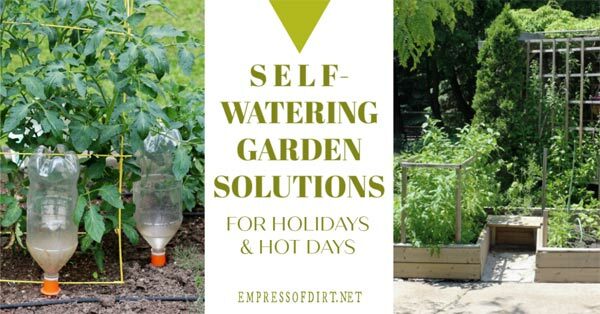 There are several options for self-watering systems to keep your garden plants safe during the heat of summer. Automatic watering is essential if you will be on vacation or unable to water during the intense heat of summer afternoons. Some of these options also work for indoor houseplants. For more gardening tips and ideas, see the Grow section. There are also tips for manually watering houseplants here. Good news, gardeners! Your plants may actually do better with self-watering systems! Why? Because they deliver a nice, slow, even water to the plant roots, right where it’s needed. And, from the plant’s point of view, this is quite a relief compared to our hurried, sporadic watering habits. Actual water needs of plants vary greatly depending on a variety of factors (type of plant, soil, sun, climate), but it’s fairly universal that a gradual, deep watering is best. 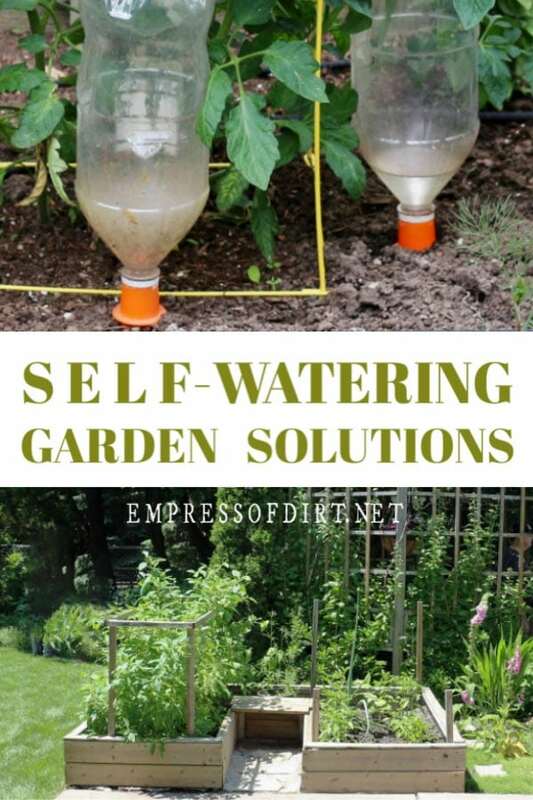 The self-watering solutions you see here are useful not just for vacationing gardeners but anyone who would like to put the task of watering on autopilot. Or at least have some reliable help. As with any living things, they will still need your time and attention, but simple self-waterers can be very handy indeed. Two things to keep in mind. The information provided here is general. You must adapt according to watering laws and restrictions in your area. If you prefer organic gardening practices like I do, check first that any products that come in contact with your garden plants, soil, and water, are rated food-safe and will not contaminate the soil. I’ve also added a few quirky self-watering options for houseplants as well. These garden pots have built-in water chambers. They are designed to have water available as needed and collect any overflow from excess watering. Choose traditional pots (left) or the stackable style which offers a lot of growing space for a patio or balcony. Gardeners have been using plastic and glass bottles to automate plant watering for years and these products are a spin-off of that idea. Water spikes (which are long and narrow) are a good choice if your space is limited in a container. There are also clay versions called ‘water nannies’. Self-watering spikes fit on a standard water or soda bottle. The larger clay style is suitable for wine bottles. The long, pointed tip helps deliver the water deeply to the roots where it’s needed. 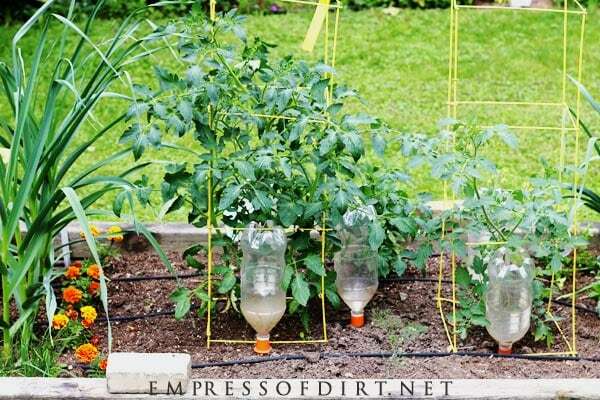 If you want a DIY alternative to this, you can simply drill holes in the lower 4″ of a plastic bottle and bury it in soil next to the plant roots. Fill the bottle with water as needed and you’ll get a nice slow release of water. If you need to keep a large garden bed watered, a drip irrigation system may be your best solution. It’s ideal if you are on a well system without any water restrictions or additional costs. I have not used these but I see them all the time when I’m visiting gardens. Drip irrigation systems like the one pictured (above) allow a more complex arrangement, positioning several hose arms exactly where you want them, either in the ground or containers. A simple version of this is to get a good soaker hose and put it on an outdoor timer, controlling when and how long it waters. The timer will also help prevent over-watering (or forgetting the hose is on). There are also timers with multiple heads if you are running several hoses from the faucet. You’ve probably seen globes like these ones made of either plastic, clay, or glass. I like the glass ones with long spikes. Available in a variety of colors and shapes (includes birds, frogs, and more), they work nicely to deliver water deeply in containers. If you use them in a hot or sunny location, watch out for water loss due to evaporation and check the soil regularly to make sure it is getting watered. The smaller the globe, the less water your plants are getting, of course, so they’re not a solution for longer term watering. If you’re away on holidays, it’s a good idea to move plants out of direct sun (to avoid drying out) and let them rest in the shade until you return. I’m including these ones simply because they are very sweet and so popular right now. They would definitely bring cheer to anyone’s desk. Pick your favorite monkey, panda, pig, kitten, dog, duck, or bear (or all of them) and grow tiny plants like these super-mini bonsai. There are a few versions, but the main idea is the animals take water from the cup or reservoir as needed. And you have to admit they’re rather adorable. I’m guessing you noticed the cuter the self-waterer, the less practical they are!